Introduction: Okuma follows the success of their Epix spinning reel by further raising the bar, with the introduction of the ultra-stylish, fully featured tournament grade spinning reel... the Metaloid. About Okuma: Many who have not heard of Okuma are surprised to discover that it is the largest spinning reel manufacturer in the world. Okuma has a long history of OEM manufacturing, and in recent years has stepped up to become a major player with the introduction of their branded products. 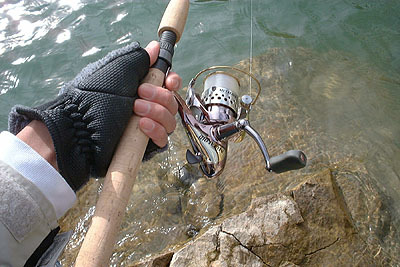 Okuma is well known today for a complete range of products including spinning reels, lever drag casting reels, and rods. Key to Okuma's success is their focus on the development of strong product offerings with an eye on value. Impressions: When we first received the Metaloid from Okuma we were blown away by the uniqueness of this reel. The Metaloid is visually impressive and looks like a space age weapon straight out of a science fiction movie. The Metaloid features a polished mirror finish and characteristics that showcase Okuma's increasing level of workmanship. 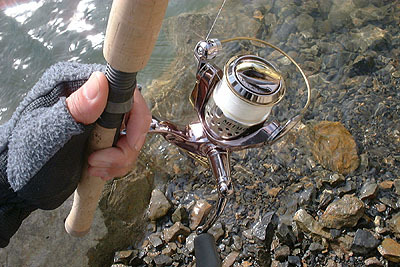 The two immediate elements of the reel that were the most impressive was the drilled aluminum spool which also sported a titanium lip, and the sleek machined aluminum handle that extends to a soft new Okuma style knob. The best way to describe the way the frame and metal felt was "soft," with its curvaceous lines and slick finish. The Metaloid certainly looked like a million bucks, and we were eager to see if it felt equally as good. The Test: The Metaloid construction is unique in that it features a innovative corrosion resistant high modulus graphite frame. We couldn't believe this reel was graphite. With a reinforced layer of gloss, and aluminum plating, the Metaloid feels like solid metal. 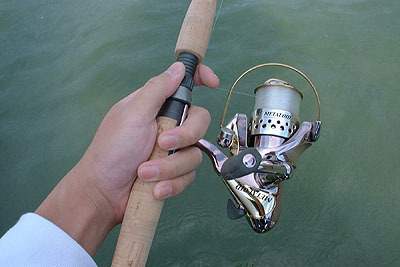 Casting: We first took the Metaloid out for extended casting tests and the reel did very well casting a range of weights. Casting with the drilled aluminum spool is definitely nicer then with the spare spool. Casting smoothness and distance are both enhanced with the drilled spool because of a larger diameter so less line rotations are thrown and the titanium lip definitely feels smoother then the standard aluminum. Retrieve: Next the Metaloid was put through the paces in retrieve tests. It was no surprise that the Metaloid was silky smooth. The Metaloid features 9 ball bearings and one infinite reverse roller bearing which works quite well....we experienced absolutely no back play in the reel. In addition the bail return on the Metaloid is quick and accurate requiring surprisingly little pressure due to a well made spring loaded internal bail trip. There was very little discernable spool wobble and line is reeled back onto the spool evenly. The MD30 Okuma sent us for testing features 5.0:1 ratio which was perfect for spinners and plastics, but to broaden the capability range of the Metaloid series, Okuma also produces a 6.3:1 version (MDS-30) for ultra fast retrieves for those top-water applications. The Drag: Here is where the Metaloid begins to show its real advanced features and well thought out design. The Metaloid features large multiple disc drag system that produced in test after test very smooth fade free performance. The drag is also waterproof. The Metaloid employs Okuma's EDS drag system which is 30% oversized to offer superior stopping power. Interestingly the EDS also was able to be finely adjusted in minute increments better then reels costing twice as much as the Metaloid! The Details: The Okuma Metaloid features numerous innovations from the very construction of the reel itself to its precise drag system. The performance of the reel in all tests was excellent. The only area where the Metaloid could be improved is in overall weight. At a total weight of 11.7(oz) the Metaloid is slightly heavier then the competition which weighs in at a average of 10.5-11.5(oz), will you feel this in extended casting....probably not. The quality workmanship on the Metaloid is impressive, and smooth lines combined with a innovative coated modulus graphite material make for a solid performer. Conclusion: Okuma produces a real winner with the Metaloid! The Metaloid echoes the very mission of Okuma...to produce top notch products without the astronomical prices. 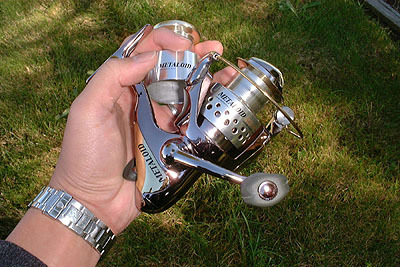 At 79.99 the Metaloid is an incredible value that offers any angler the opportunity to fish with a high performance reel. While some may find the Metaloid design flashy others will no doubt love the Metaloid's premium look and feel. in any event the Metaloid offers a unique balance of innovative features and performance at a amazing price....making it a worthy recipient of TackleTour's "Best Value" award!